GRILL DIRECTIONS: In medium saucepan, combine water and lentils. Bring to a boil. Reduce heat; cover and simmer 5 minutes. Add rice, onion and salt; mix well. Cover; simmer an additional 15 to 18 minutes or until liquid is absorbed and lentils and rice are tender, stirring frequently. Remove from heat. Heat grill. Stir 2 tablespoons of the pizza sauce and remaining ingredients into lentil mixture, mashing mixture slightly while mixing. Refrigerate 5 minutes or until cool enough to handle. With wet hands, shape mixture into 6 patties, 1/2 inch thick. When ready to grill, lightly oil grill rack. Place patties on gas grill over medium heat or on charcoal grill 4 to 6 inches from medium coals. Cook 6 to 8 minutes or until patties are golden brown and firm, turning once. In small saucepan, heat remaining pizza sauce until hot. To serve, spoon warm sauce over patties. To broil patties, place on sprayed broiler pan; broil 4 to 6 inches from heat using times above as a guide, turning once. Like beans and peas, lentils are legumes. The small, lens-shaped dried seeds are popular in Europe, India and the Middle East. Lentils come in many colors, any of which will work for these patties. 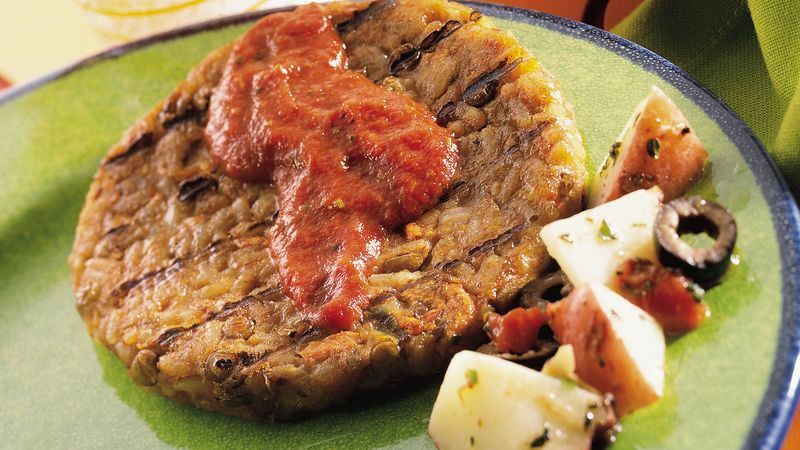 Perk up these patties with a Mediterranean-style potato salad made with cooked potato wedges, chopped onion, olives, roasted red bell peppers and marinated artichoke hearts. Use the marinade from the artichoke hearts to dress the potato salad. Season with oregano and pepper. If desired, serve the patties in whole-grain buns.